The red color is eye- catching, there’s a window to peek inside, and the inscription invites you to help yourself to the gourmet bonbons. It measures 5” X 5” X 6” high and can hold at least a pound of wrapped candies. 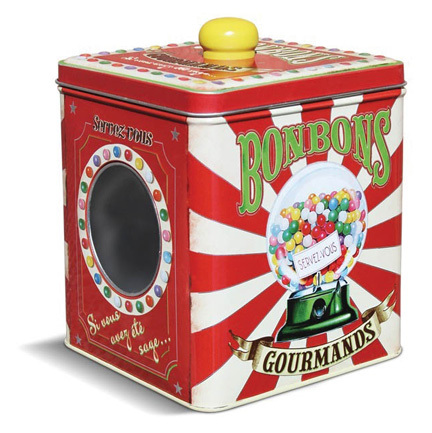 I bet you can find the right place for this fun storage tin, whether on a kitchen shelf or your office desk. Or fill it up with special goodies to create a memorable gift.